*Any length 5.8M+ will be supplied in 5.8M cuts and balance. *The price specified is for every 1 meter and also includes VAT. Length (m) * Please fill in a legitimate length! Categories: All, Aluminum Profile [1.x...], Buy By Length, Modular Assembly Systems, PG45 [1.11.45.x...], Strut Profile [1.11.x...]. 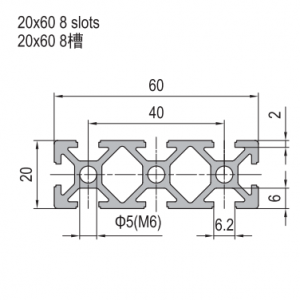 This product is a STRUT PROFILE PG45 45X45 2 SLOTS TYPE B with a mass of 1.9kg. It’s ideal for light constructions, such as building stands and laboratory fixtures. These profiles make up the biggest part of most constructions, being used to build the frame and the base that other elements are added to or branch off of. Finally, along the sides of the profile are t slots – which are used to connect various elements to the profiles. To download 2D auto-cad file: Click here. To download 3D auto-cad file: Click here. To download 4D auto-cad file: Click here.